Call Sam Sherrington on 0452 472 959 for more information on Human and Animal Osteopathy. It is established that more than 47% of the sports horse population in normal work may be lame, without having been identified as such by their regular owner or trainer. A new study by the industrious and ever driven Sue Dyson and team has made huge headway by testing the validity of a list of easily observed behavioural features that may indicate lameness in the ridden horse. The ethogram allows owners and riders to be more attuned to the signs that their horse may be in pain and thus could help to reduce the incidence of undiagnosed lameness in performance horses. The study compared the frequency and reliability of a group of 114 behaviours and reduced the list down to 24 reliable signs that occur significantly more frequently in lame horses than non-lame horses under saddle in trot and canter, when working large, on 20m and on 10m circles. Many of the behaviours discovered to be significantly more common or exclusively seen in the lame group of horses are commonly viewed as purely behavioural and thus often addressed by stronger tack/equipment or punitive training methods. This study therefore provides some very compulsive evidence for always giving the horse the benefit of the doubt when a new or unusual behaviour crops up during work. If ≥ 8 of the 24 identified behaviours linked to pain are observed within a fixed period of 3-5 minutes, it may be advisable to seek out a specialist for assessment of pain (lameness) in the horse. So, keep this list of prime signs in mind if, while working with your horses, they begin to show undesirable behavioural changes. Young or green horses may be expected to show some of these signs as they are physically and mentally establishing their work, however if the behaviour continues then it is also well worth considering as a possible sign of pain. Working on 3 tracks in a straight line. Increased frequency or changes in frequency of steps within a gait, especially if when going from large to small diameter circles. Unwillingness to move forwards and resistances. 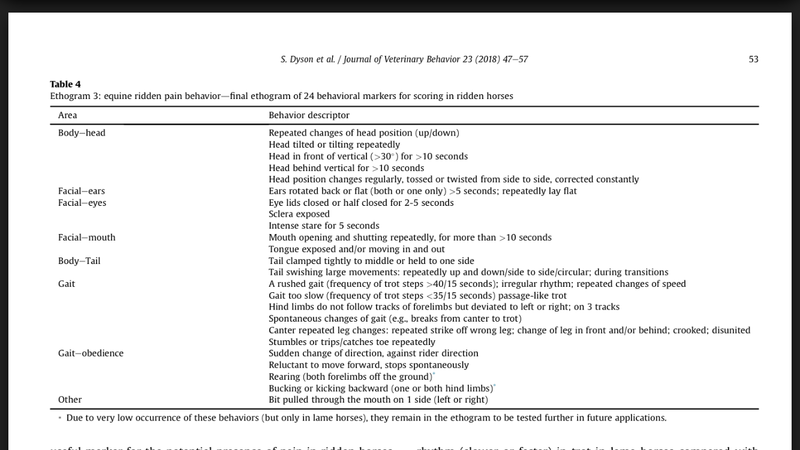 The full list of 24 signs is below for those really keen to keep on top of this aspect of horse management. First port of call for all overt lameness cases is your vet, and once veterinary sources of pain are eliminated Sam Sherrington – Equine Osteopath if in the Hills and Hawkesbury regions of NSW, Australia or another Osteopath or Chiropractor (or Veterinarian trained in biomechanical treatment of horses) who has university level training to assess and treat musculoskeletal causes of lameness and pain. Previous Previous post: Dangling front legs!